Crabtree & Evelyn La Source offers pampering products for the perfect home manicure! When you can't get to the spa, the spa comes to you via the Crabtree & Evelyn La Source line of products which draw inspiration from the restorative powers of the sea and are formulated with a blend of ingredients such as algae, mineral salts and seaweed to restore, condition and rejuvenate along with a sea air fragrance that will transport your mind to a tranquil summer vacation destination. La Source Hand Recovery - 100g - $26 - deeply cleanses, exfoliates and moisturises hands with a refreshing blend of algae extract and rich shea butter. To use: massage Hand Recovery into your hands, front and back - then rinse for skin that feels polished, smooth and moisturised. La Source Ultra-Moisturizing Hand Therapy - 100g - $20 - an intensive conditioning cream that leaves hands feeling softer with each use - formulated with conditioning shea butter, algae extract and macadamia nut oil to moisturise and soften hands. To use: apply Hand Therapy to hands to lock in moisture and leave skin smooth and delicately fragranced. Place a dime-size amount on the back of one hand. Put your hands back to back and rub together to spread evenly, then spread remaining Hand Therapy to your cuticles and palms. La Source Nail and Cuticle Therapy - 15g - $16 - helps strengthen the nail and reduce brittleness and breakage. Formulated with panthenol and keratin, our La Source Nail & Cuticle Therapy helps protect nails and soften dry, flaking cuticles. To use: apply to dry hands and massage into cuticles and nails to protect and condition. 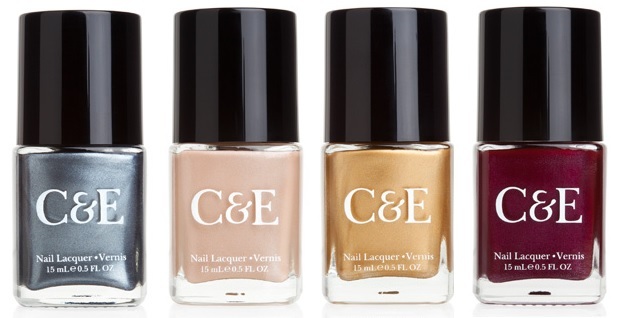 C&E Nail Laquer - $6 - in 34 shades from neutrals to lights and darks to brights: Clear, Lady Slipper, Mother of Pearl, Sugar Plum, Deep Ocean, Opal, Peaches & Cream, Alabaster, Black Tulip, Almond, Anthurium, Mocha, Cinnamon, Cobalt, Silver, Petal Pink, Wisteria, Pistachio, Pomegranate, Sand, Cardinal, Tomato, Eggplant, Sky, Blueberry, Slate, Apple, Clay, Gold, Mica, Snowdrop, Black Cherry, Avocado and Copper - that apply beautifully, dry fast and are formulated without camphor, dibutyl phthalates, formaldehyde or toluene, leaving you with a rich, eye-catching colour that lasts.